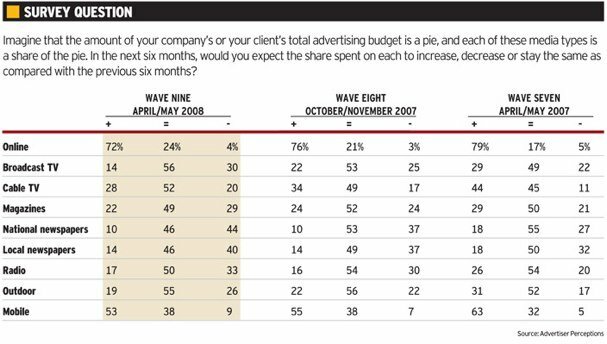 Market Research firm Advertising Perceptions released a new survey of 1,811 media buyers showing that a whopping 72% of them believe Internet advertising spend will increase in the second half of 2008. This is a shocking finding, considering that no other medium (other than mobile) was expected to grow by more than 28% of the respondents. The outlook for newspapers and radio was especially pessimistic, with more than a third of respondents projecting overall spend to drop for those media in the next 6 months. While we’re big supporters of mobile here at C&C, 55% of media buyers suggesting that mobile spend will increase was also a suprise. As a somewhat experimental tactic, we’d expect mobile to be set aside temporarily in this down economy. However, the measurability of mobile (which is also a terrific database acquisition tactic) could be fueling the optimism about it. Without question, the measurability of Internet advertising and search marketing is what’s driving the move of ad dollars from traditional tactics like newspaper toward digital marketing. This move is going to be even more acute in a recession, as digital’s cost-effectiveness, speed of deployment, and targeting capabilities make it a “safe” media bet for most companies and agencies. It will be very interesting to see if this movement of ad dollars toward digital results in markedly higher CPMs for banner ads by year end. We’re already seeing increases in PPC costs due to the “over-popularity” of Google.